A while ago, I decided it would be a fun thing to try to detect the 21cm hydrogen line. The 21cm line is a hyperfine structure line of hydrogen; the latter is abundant in interstellar matter in our galaxy (and in other galaxies too). That makes this transition’s radiation an interesting object to study, especially because you can determine the velocity of the regions emitting the raditation quite precisely by looking at the doppler shift of the radiation. That makes it possible to construct for example rotation profiles of galaxies. You can do that even if your spatial resolution is low (which is important, since spatial resolution is limited by the size of your antenna: as a rule of thumb, the area you see as one big smeared “pixel” is about the inverse of the size of your antenna expressed in wavelengths taken as radians — so if your antenna is 1.05m big, which is 5 wavelengths at 21cm, that gives you a spatial resolution of about 1/5rad which is about 11 degrees. That’s about 22 sun diameters, which is really bad if you wanted to make an image of the sky). First thing you need is an antenna. 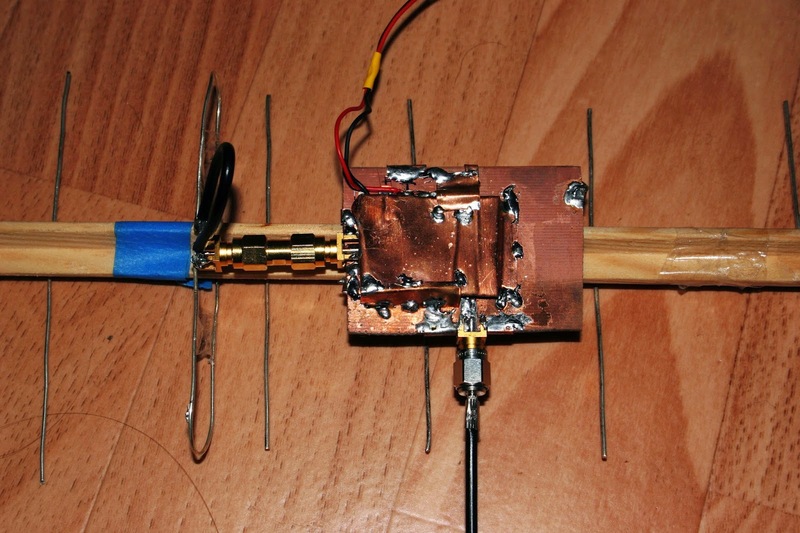 For this purpose, I built a 14-element Yagi antenna, as seen below. Closeup of the amplifier next to the resonator of the antenna. The circuitry is hidden below the copper shielding. It has quite a lot of tape on it — I underestimated the size and need for mechanical stability a bit. For the next try, I will definitely use a more sturdy piece of wood as the base. Anyways, first measurements indicate that it should work well enough; not great, but good enough for a first test. S11 of the yagi antenna shown above. x is frequency, y is log reflected power (lower is better). The second thing in the signal path is a preamplifier, which is usually placed directly at the antenna and has the purpose of amplifying the received signal before any degradation can happen (e.g. through cables, which weaken the signal and add noise). The noise figure of the preamplifier (which is often called LNA, for low-noise amplifier) is important; it tells how much additional noise will be present in the detected signal. The noise figure of all subsequent amplifiers is usually not relevant: they amplify the noise added by the LNA, which is far worse than their own added noise. 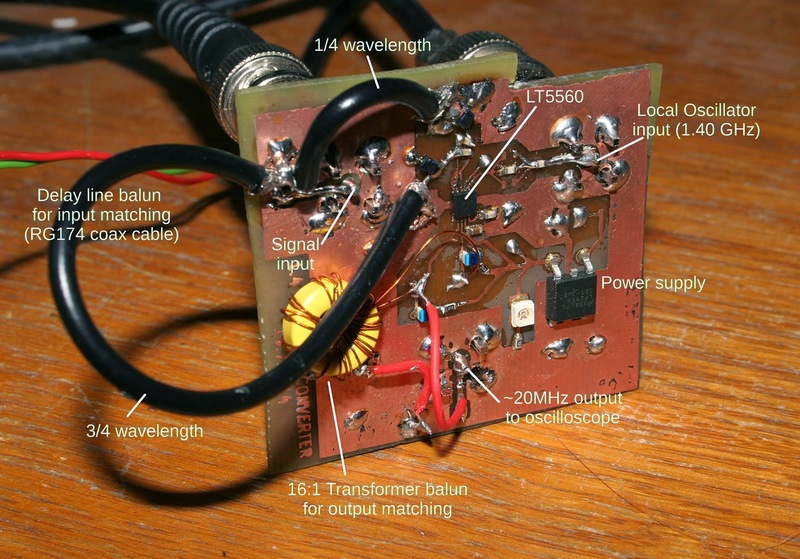 Thus, it makes sense to carefully design the very first amplifier, while the rest of them can be as cheap and simple as possible. It is very difficult to design a good LNA though; so for some first tests, I use a generic wideband amplifier IC as my preamplifier, which has a not-very-good noise figure of 2dB. I hope it will work as a proof-of-concept; I plan to add a proper LNA later then. The next thing you want to do is to somehow amplify the received signal so much that its quality is limited by thermal noise: as soon as you reach that point, further amplification buys you nothing, you need to improve the antenna or cool your LNA. How much amplification that is exactly will depend on the circumstances, but since my measurement device can detect power levels down to roughly -120 dBm/Hz without problems and thermal noise from the antenna will probably be somewhere around -180 dBm/Hz, I will need somewhere around +60dB amplification at least — better a bit more. That’s about a factor one million more power. First, besides the noise figure, another not-so-obvious disadvantage of a wideband amplifier is that it is, well, wideband: it will amplify everything, especially for example the very bright GSM (mobile phone stuff) band around 937 MHz. That is bad, because such a strong signal can cause intermodulation products which affect the quality of the signal you actually want to detect, or even cause the amplifiers to go into saturation. 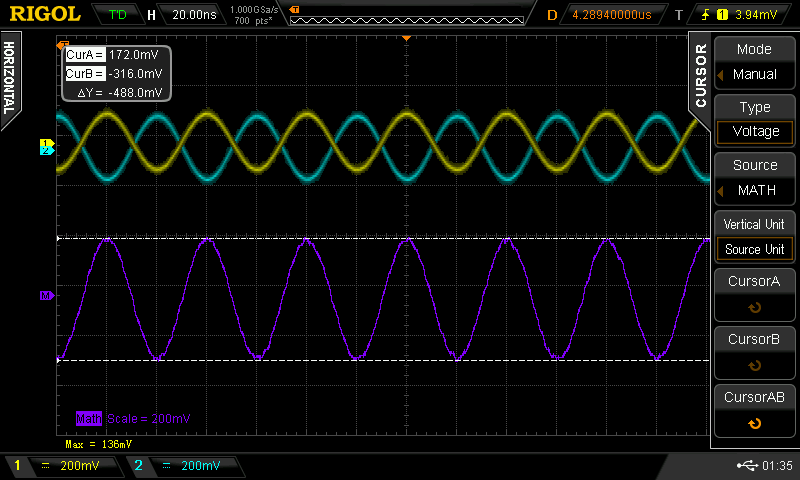 Second, it is very easy to turn broadband amplifiers into oscillators. You have to strictly separate them from each other and avoid any kind of feedback, or they will start spitting out large power levels at seemingly random frequencies. Both problems seem easy to solve by building a bandpass filter — but I found it quite hard to build a good bandpass filter for 1.42GHz. It is a frequency where lumped-element filters (those made out of capacitors and inductors) are not really viable any more since you need capacitors with incredibly small values, while distributed-element (microstrip, see this blog post) filters are not that great either because a half- or quarter wavelength of 21cm is still pretty large. 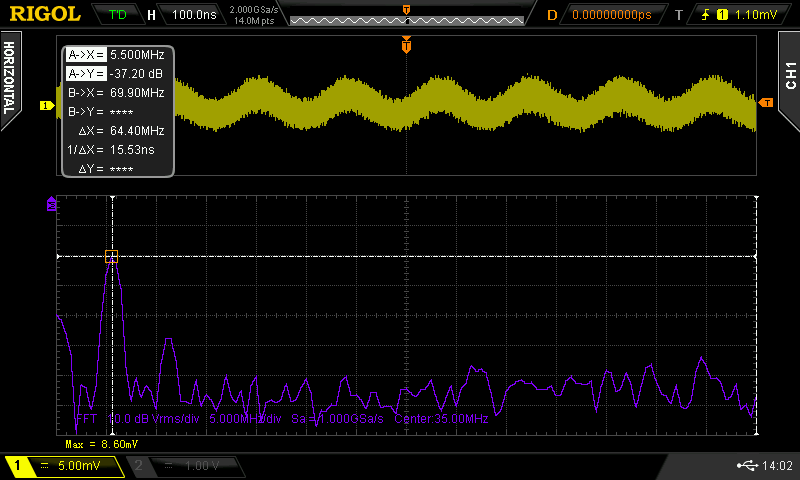 All those resaons taken together brought me away from using this simplest possible solution, so I decided to try what all the cool people do: use a frequency mixer to bring the signal down to a more manageable frequency after the preamplifier, then amplify and filter it at that low frequency. A frequency mixer is effectively a device which shifts the spectrum of a signal along the frequency axis: Mixing a 1GHz sine with a 995MHz sine will result in signals at the difference (and the sum) of those frequencies, so a 5MHz sine (and a 1995MHz sine, but that can easily be filtered away — if you don’t want it). Signal components which are shifted below 0Hz appear mirrored at the appropriate positive frequency (so, if a signal would be shifted to -3MHz, it will appear at 3MHz instead — with a phase shift, but that is barely relevant). Mixers are very versatile devices which are used basically everywhere where radio frequency signals are present — for example in WLAN, in GSM, radio, or satellite television (in the latter, there’s actually a mixer in the LNA thing which you put in front of your satellite dish which shifts the received ~10GHz signal to somewhere around 2GHz to reduce losses in the cable to your TV receiver). Professional radio astronomy applications tend to use more than one mixer stage to lower the frequency gradually (that has various advantages mostly related to filtering), but I hope I can get away with just one stage for this project. I thus built a test board based on the LT5560 mixer (~3€) which is designed to mix a 1420 MHz signal down to 20 MHz using a 1400 MHz local oscillator (LO, that’s the name for the frequency you’re mixing the signal you’re interested in with). As the LO, I use a programmable frequency synthesizer I built a while ago which is based on the ADF4350 (~8€, but wow that thing is difficult to put on a working board — took me three attempts with a new board design each). 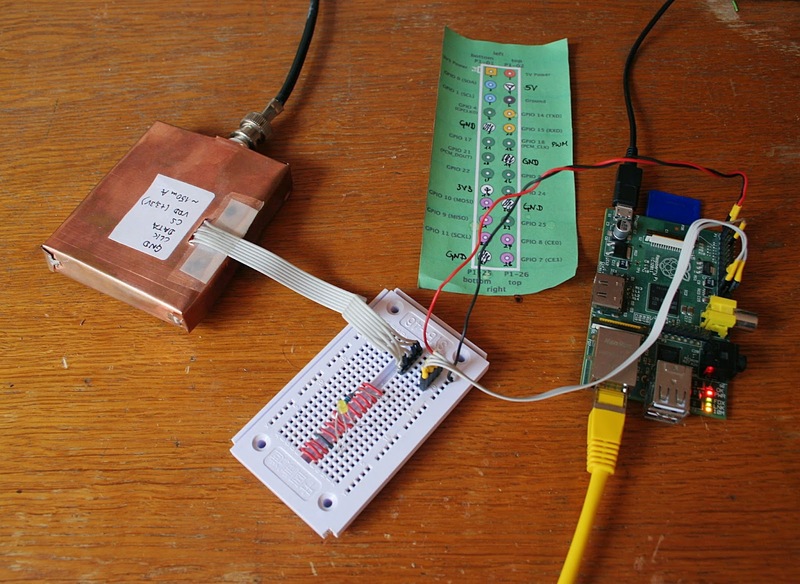 ADF4350-based frequency synthesizer (left) controlled by a raspberry pi (right). This construction is used as the Local Oscillator (LO) for the mixer. A 1399.5 MHz signal is produced by this circuit on the coaxial cable on the left. The former only works for low-ish frequencies (I don’t know exactly how high you can go while they’re still usable, but it will be somewhere in the few-hundred-MHz area, at least for handmade ones), the second one works for high frequencies as well but is very narrow-band (it only works for one specific kind of signal). In my test board, both are used: a delay-line type balun is used to convert the unbalanced input from the LNA into a balanced signal, and a transformer-type balun is used to convert the balanced mixer output into an unbalanced signal for the next amplifier stage. I will not go into details on how to build those baluns here, but good documents describing how to do it include this, this (german), this and this (ready-made components are available and are not even very expensive, but I did not find any Europe-based distributor who actually sells them. And I don’t want to pay $20 shipping fees and wait a week each time I need a part). The S11 curve of the delay-line one is much sharper than the one shown here, and it also has a better return loss at the design frequency. 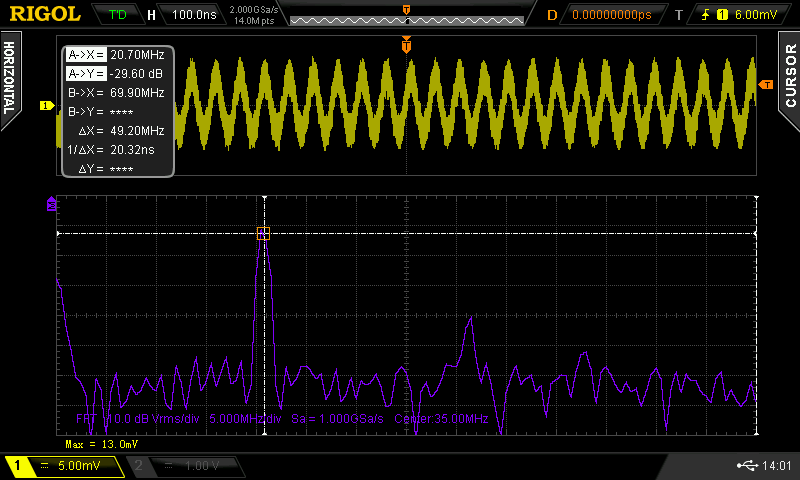 Balanced signal created from an unbalanced input with the transformer balun. The yellow and teal curve show the plus and minus components of the balanced signal, the violet one is their difference, which resembles the original unbalanced signal. Input level is 0dBm. A balun can also have an impedance transformation ratio, which in this case plays an important role in impedance matching. The transformer balun I built is a 16:1 balun, which takes a 800Ω unbalanced signal and turns it into a 50Ω balanced one — very convenient for this mixer circuit here, since 800Ω is reasonably close to the mixer’s output impedance (as detailed in the data sheet) at that frequency. LT5560 active mixer test board. Yes, it looks quite horrible because lots of repairs were needed after the initial fabrication 😉 Next one will look nicer. 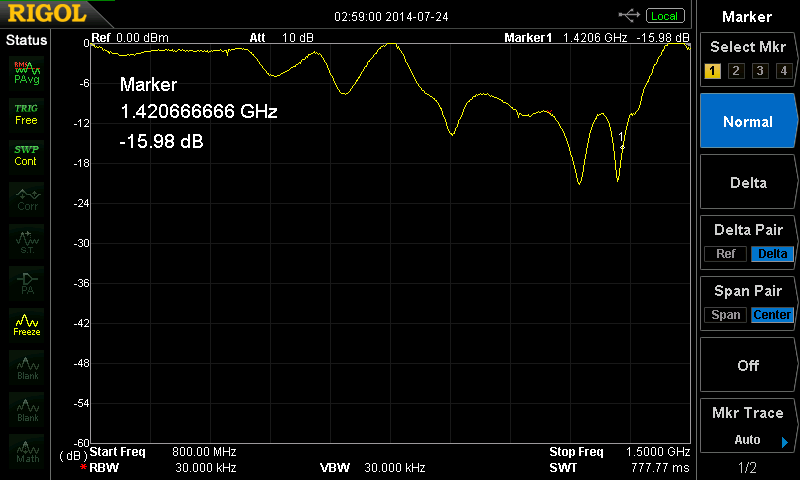 Output of the mixer circuit for 1.3995GHz LO frequency and 1.42 GHz input frequency. Upper panel is time domain (time — voltage), lower panel is frequency domain (frequency — power). 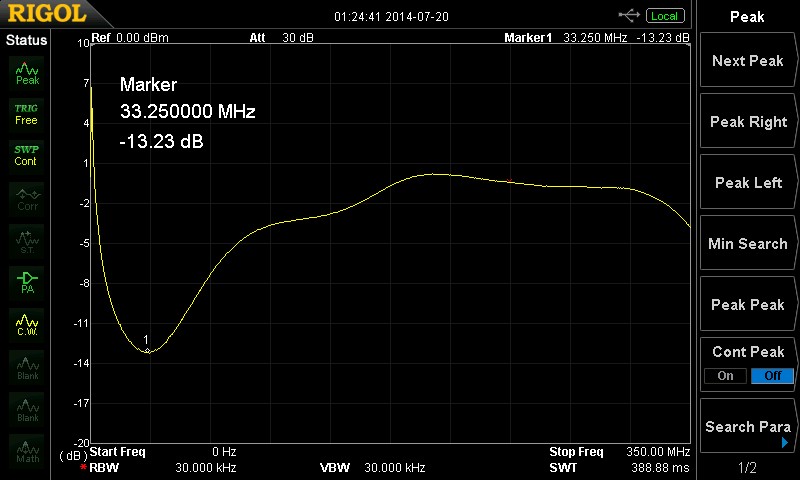 A strong tone is present at the difference of the two frequencies (20.5 MHz, where the cursor is). Mixer output for 1.3995GHz LO and 1.405 GHz input. If the input frequency is lowered to and then below the LO frequency, the frequency peak moves to the left until it hits zero frequency and then starts moving right again. 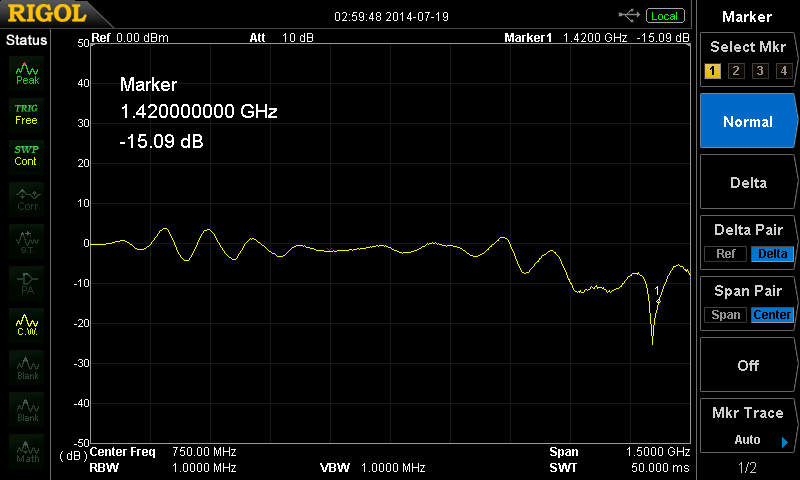 There’s some fairly strong “noise” on the output which seems to be somewhere around 400 MHz. I’m not sure where that comes from (higher-order intermodulation product?) but it will be easy to remove through a low-pass filter. Now, most of the difficult components for my 1.42GHz receiver should hopefully be in place. I plan to build a 20 MHz amplifier and lowpass filter shortly; I hope to be able to present a few more concrete results here shortly! kdevelop-python for Python 3: first stable version (1.6.0) released! 1420.4 MHz Hydrogen line: There it is! Hello. I’ve developped a 1420 MHz system that I’m going to completely refound. For the time being I use a SCM-2500 as mixer and I would like to replace it by a LT5560. My question : have you an updated schematics of this board ? Cool! Any details on that project? What exactly are you looking for when you ask for an updated schematic? The one I uploaded is pretty much the final version available, I didn’t really develop it further from there.